In 1998, Pacifica Nurseries, Inc. began as a small cross-border brokering company in Abbotsford, British Columbia. We’ve since grown and expanded across the border into the United States, adding another office location in Woodinville, WA. Pacifica Nurseries exclusively focuses on providing wholesale plant materials to landscape contractors, cities/municipalities, and wholesale nurseries. With a strong grasp and knowledge on the availability of plants, the service team has the ability to provide a best-in-class model to support all quotes and deliveries. Pacifica Nurseries supplies plant materials to numerous U.S. Fortune 500+ companies and has successfully completed projects with Microsoft, Google, and Amazon. 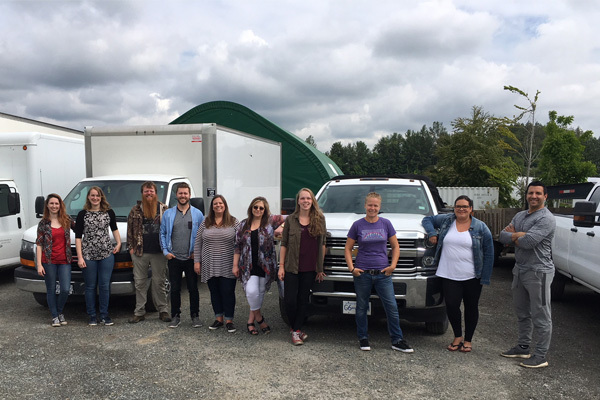 As a respected leader in the industry, Pacifica Nurseries manages the laborious responsibilities associated with the logistics of brokering – allowing customers to stay focused on their bottom line. From quaint street renovations to the most demanding large scale residential projects, Pacifica Nurseries is trusted to deliver plant materials to the most discerning contractors across the Pacific Northwest. With a variety of different sized trucks, Pacifica’s professional and skilled delivery drivers can access even the tightest job site. Located in the heart of horticulture-rich Abbotsford, the Canadian location features 5 acres of spacious ground, offering immediate access to an assortment of plant materials and provides efficient sourcing with a quick, convenient turn-around for any project. Irrigation and climate controlled greenhouses help maintain material at the highest quality over time. For future projects requiring ultra-specific varieties or large quantities of plants, contract growing eliminates the risk of substitutions due to the subjectivity of crop availability and guarantees correct quantities, sizes and quality. Contract growing is perfect for bulkier projects planned 6-18 months or more in advance.